Before we start a game we'll need to make some basic choices and set some global settings in Big Picture mode. Once you decide what controller you want to use, make sure to connect it to your computer, and if it uses batteries, make sure that it is charged. Next, we'll visit the controller settings. 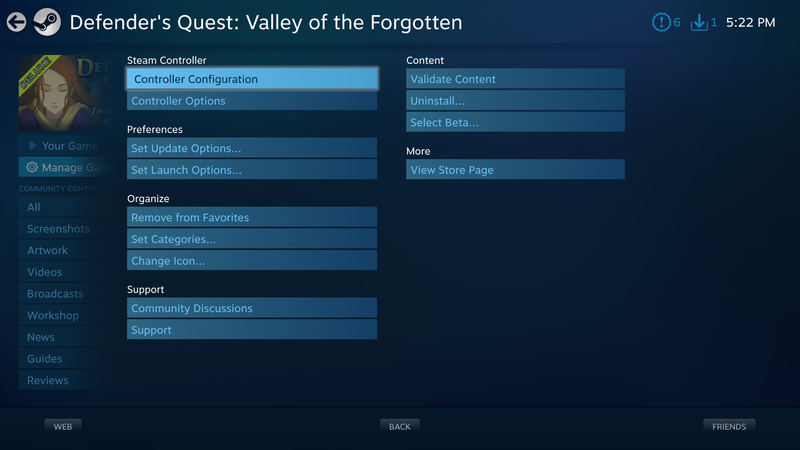 You can access these through either the desktop client or Big Picture mode. 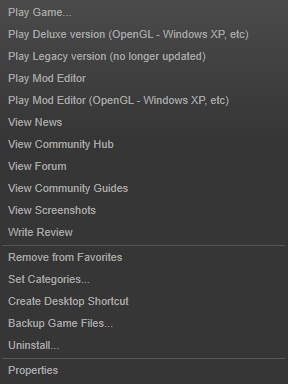 In the desktop client, select "Steam" and then select "Settings." From here you can change the general controller settings, as well as change three different global configurations. 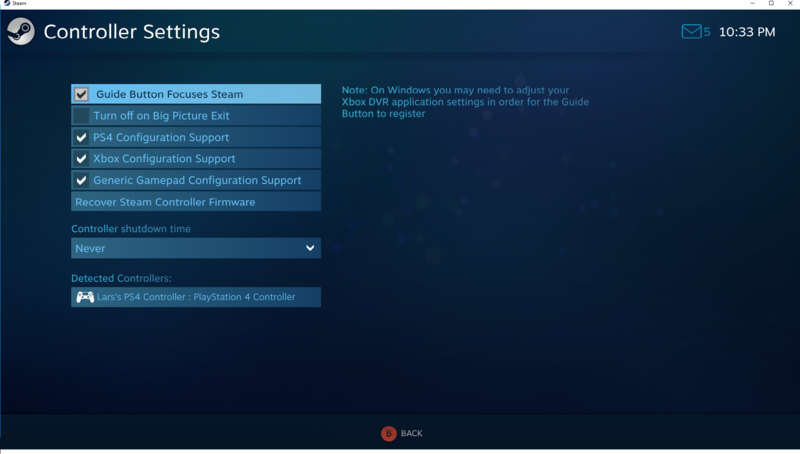 If you are using a PlayStation 4, Xbox One, Xbox 360, or generic controller, make sure you have the corresponding configuration support boxes checked. Also make sure your controller(s) is/are plugged in. 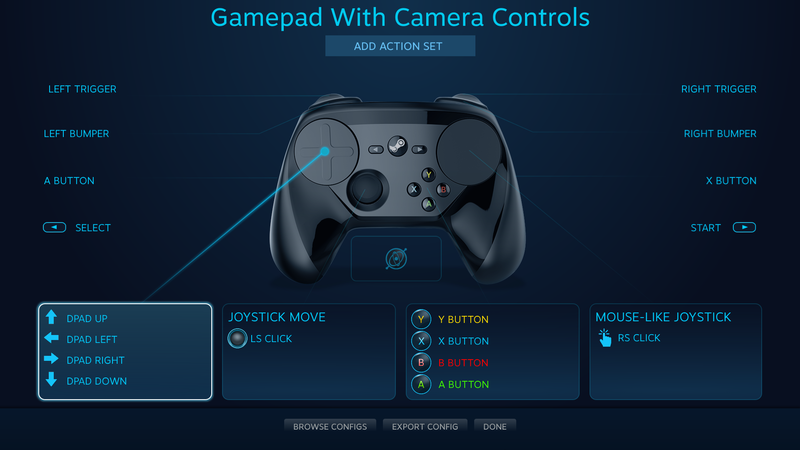 All detected controllers compatible with the configurator will show up on this screen. 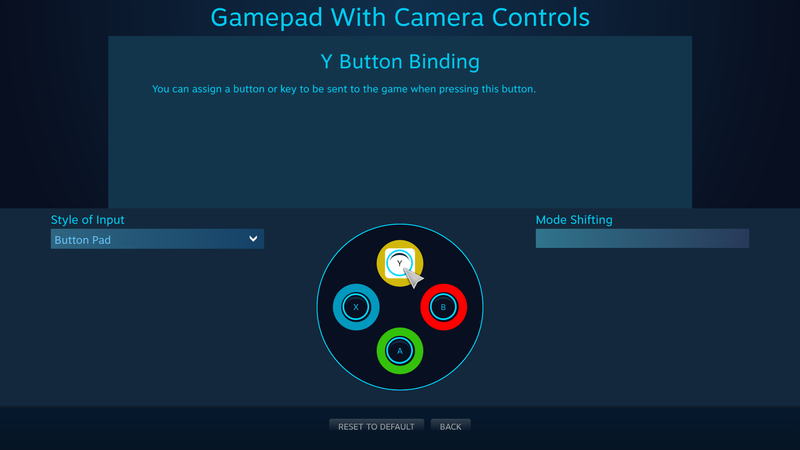 The Big Picture Configuration is your input bindings for navigating Big Picture mode with a controller. 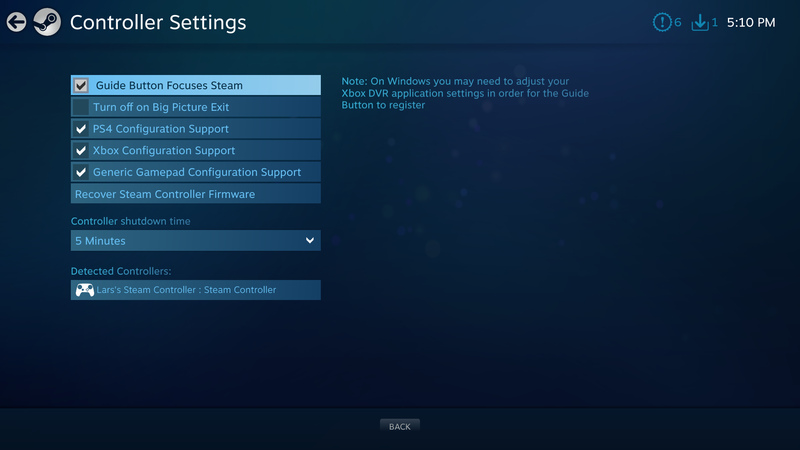 The Desktop Configuration is your input bindings for for navigating the Desktop with a controller. The Guide Button Chord Configuration requires a bit more explanation. A "chord" is a combination of button inputs -- you might be familiar with the keyboard chords "Ctrl+C" and "Ctrl+F" for "copy" and "find." The "Guide Button Chord Configuration" is thus a series of inputs that perform certain actions when you press them along with the Guide button. 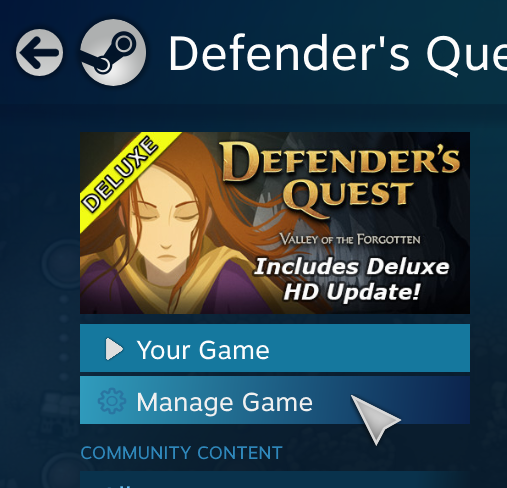 What's the "Guide" button? 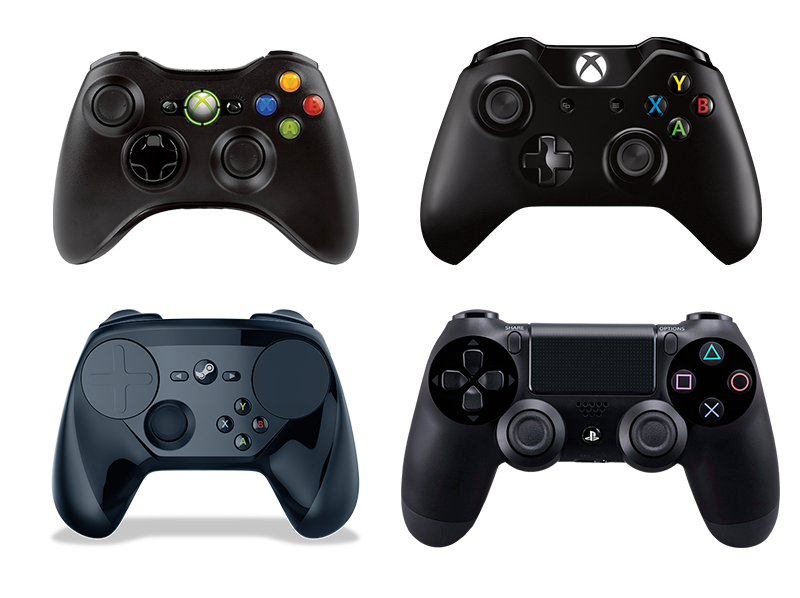 It's the big central branded button on your controller that's typically reserved for system use -- the one with the Steam logo on the Steam controller, the Xbox logo on Xbox controllers, the PlayStation logo on PlayStation controllers, etc. Because this is a special configuration, it's assumed that you've already got the Guide button pressed. So if you press the left analog stick up while also holding down the PlayStation button, you'll increase the volume. If you press PlayStation + Triangle, you'll turn off the controller, and so on. This is the only way you can set bindings for the Guide button in any configuration. 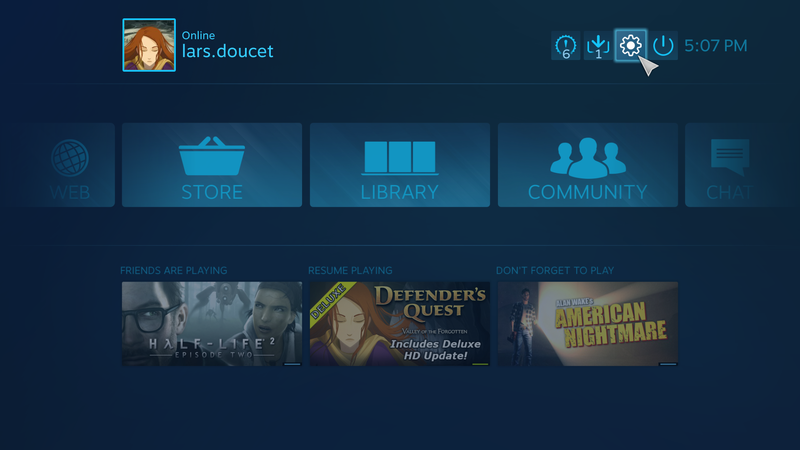 Enter Big Picture mode by clicking the icon in the upper right corner of the Steam client. Also make sure your controller(s) is/are plugged in. 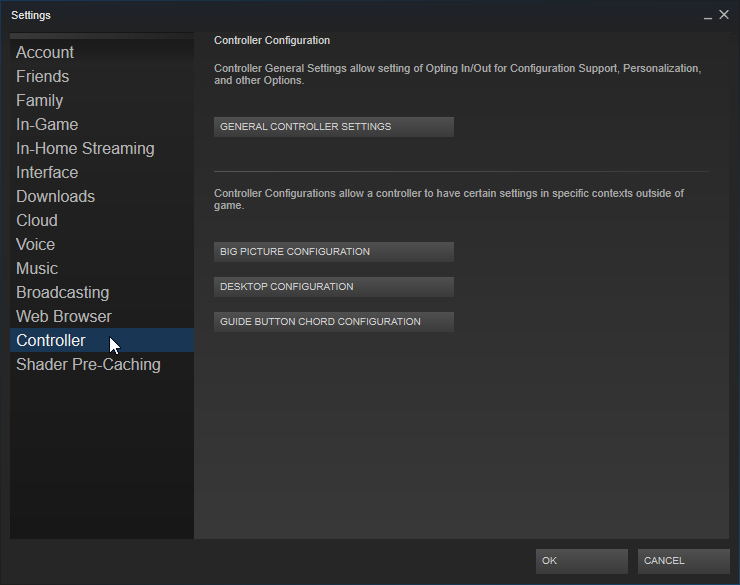 All detected controllers compatible with the configurator will show up on this screen. 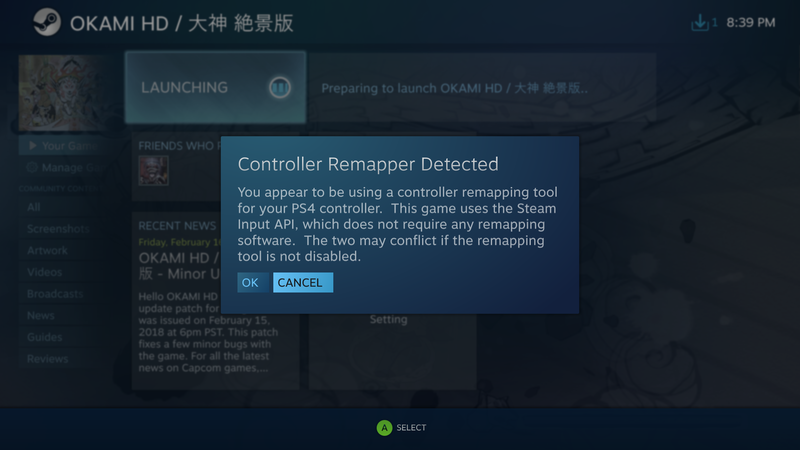 Next, we'll show you how to configure your controller for a specific game, in both Big Picture mode and the desktop client. 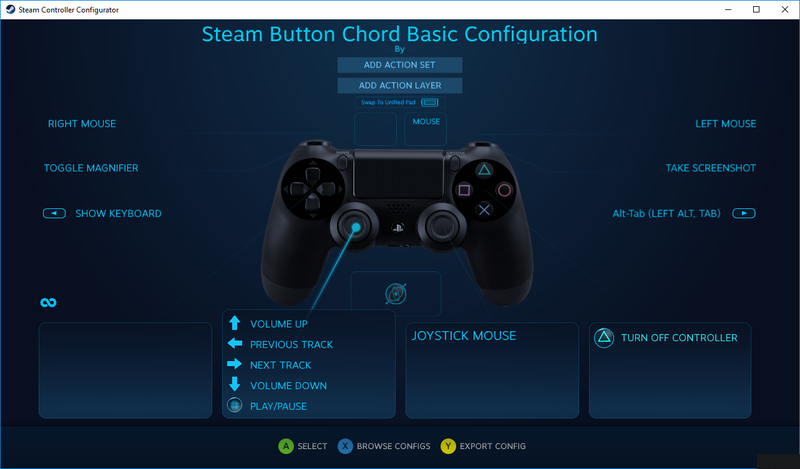 Figure out what game you want to use your controller with and right click on it in your library. NOTE: Disclosure: In this example I'm picking my own game because I have full control of its Steam Input API integration and can use it to demonstrate certain features. A context menu will now appear. You Did Plug the Controller in, Right? 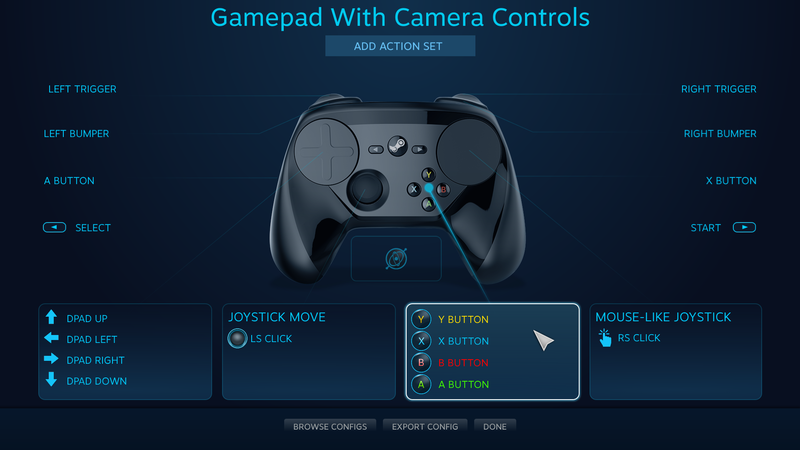 With your device plugged in and the correct menu showing, select "Edit Steam Controller Configuration..."
If you are using the desktop client, you can skip to Step 5 as the configuration screen is essentially the same for both Big Picture mode and the desktop client. Okay, so you're using Big Picture mode instead and have it launched. 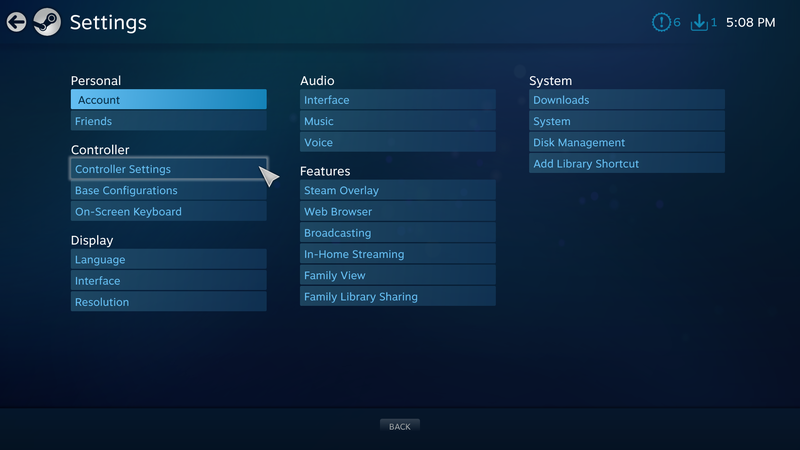 First, figure out what game you want to use your controller with and open its menu from Big Picture mode. 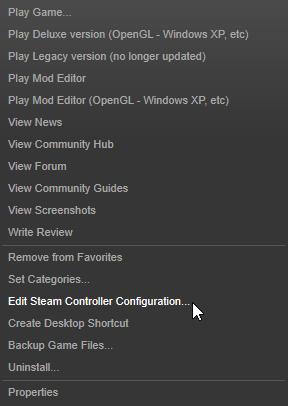 Select "Controller Configuration" to open up the controller configuration menu. Note that much of what you see here is specific to this particular game and will be different in other games. 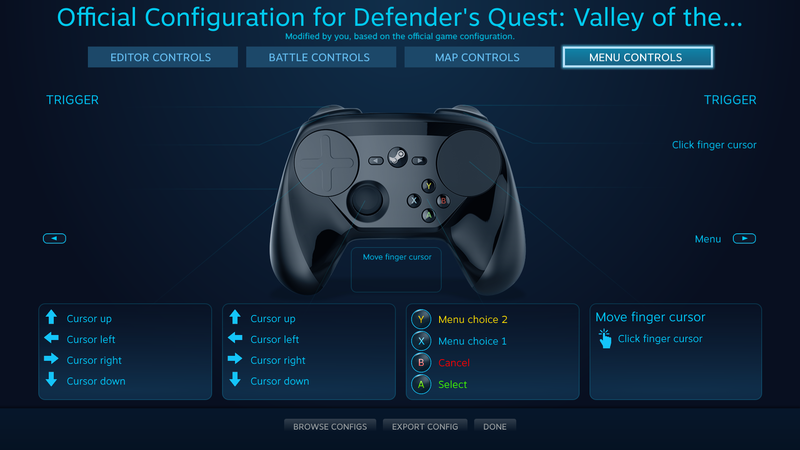 The four buttons at the top -- Editor Controls, Battle Controls, Map Controls, and Menu Controls -- are action sets. Whenever you bring up an in-game menu, the game sends a signal via the API to activate the "Menu Controls" action set. When the player visits the overworld, the game switches to "Map Controls", and "Battle Controls" activates when a battle begins. All this happens automatically without the users' input. Action bindings for each action set are entirely independent of each other, so swapping A and B for Cancel / Select in "Menu Controls" will not affect anything in "Battle Controls", for instance. Note that for this game, all of these are native in-game actions that have been defined by the developer. You can change what actions are bound to which inputs by selecting the input, and choosing an action from the list. Now all that's left is to start playing your game! 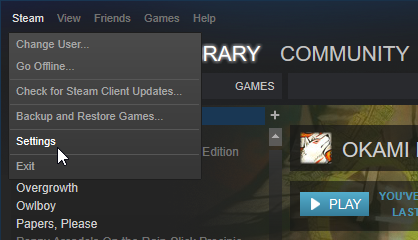 But what if the game doesn't have native Steam Input support? Let's take a look at legacy mode. Here's an RPG called Cosmic Star Heroine, which doesn't implement the native Steam Input API, and unlike Defender's Quest, doesn't have particularly complicated controls. Here, instead of binding physical inputs to native in-game actions, physical inputs are simply bound to other physical inputs. The face buttons, shoulder buttons, analog triggers, start and back buttons, and the left joystick are all mapped to their XInput equivalents. The left trackpad's input source mode is set to "Dpad", with XInput Dpad buttons bound to each direction. The right trackpad's input source mode is set to "Mouse Joystick", with right-stick-click bound to the right trackpad's click action. Here you see the legacy input binding menu. You can give this binding a name, as well as choose any of the available hardware inputs to bind to it. 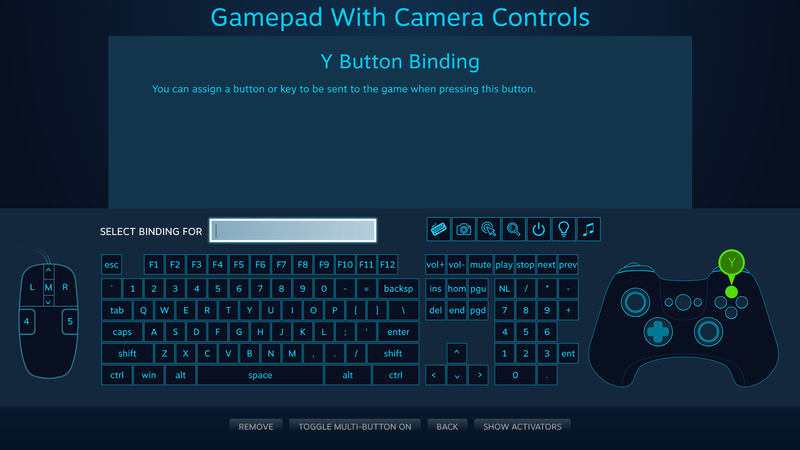 You can bind keyboard buttons, mouse buttons, and even gamepad buttons (emulated gamepad buttons will be seen by the game as XInput events). You can also bind multiple buttons to a single input (Toggle Multi-Button On), as well as set special conditions for the input (Show Activators), but we'll get into those later.